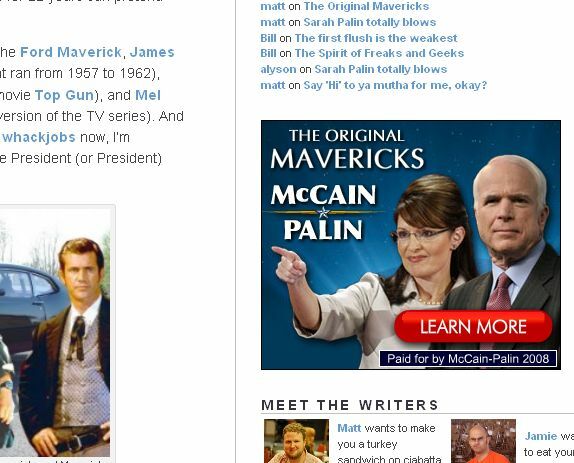 I can’t help but notice the songspeak site has had some banner ads for the McCain/Palin campaign lately. I can only imagine this is because we’ve had a few McCain and Palin related posts recently, but rest assured that we here at Songspeak in no way, shape, or form support the McCain/Palin ticket. So it bothers me that ads for them are popping up on the site. Why should it look like we’re promoting someone that we don’t support, nor agree with? Worse yet, the ad looks like some sort of satire, repeating the “maverick” catchphrase over and over. This whole maverick idea is one of the most ridiculous things I’ve seen in politics, and reeks of pandering to the lowest common denominator. “Hey, Joe Six-Pack! We’re mavericks! We’re gonna shoot up Washington with change…YEE-HAAAWWWWWW!” The whole thing seems like one big (sad) joke. But it’s for real. Frightening. (Never mind that I don’t understand how a candidate like McCain that has served in the senate for 22 years can pretend that he’d be “change”). 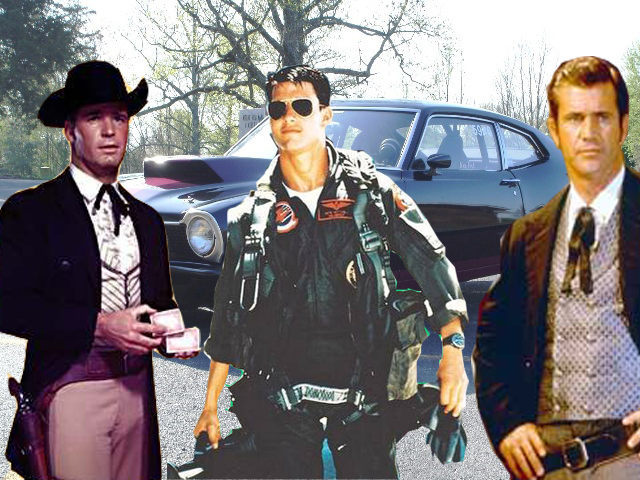 Everyone knows that the ORIGINAL mavericks are the Ford Maverick, James Garner (who played Maverick in the TV series that ran from 1957 to 1962), Tom Cruise (who played Maverick in the 1986 hit movie Top Gun), and Mel Gibson (who played Maverick in the 1994 movie version of the TV series). And even though one is a car, and two of them are total whackjobs now, I’m confident that ANY of them would make a better Vice President (or President) than Sarah Palin. Especially the car.